I’ve learned some new things about inquiry recently. I’ve been working with inquiry for some time and I love learning new ways of practicing. The three things I learned came from my research in neuroscience. I have been reading Allan Schore’s 1994 book, Affect Regulation and the Origin of the Self: The Neurobiology of Emotional Development. The title is enough to scare anyone off. The book was recommended by a good friend of mine who is studying sensorimotor psychotherapy, a psychological approach that uses neuroscience, somatics, and psychotherapy to help people work through trauma. My friend gave me a list of authors at the cutting-edge of neuroscience research and practice. OK, I’m sure I probably lost you. Sorry. I do get my geek on. Our brains develop in and through our relationships. At key points, if a primary caregiver is absent or incapacitated, it can effect, perhaps limit, how our brain develops. We cannot replace early development but, in work settings, the value and importance of relationships needs to be underscored. Relationships is how we get work done, and valuing and fostering productive, mutual, and reciprocal relationships is essential. Our development is a dialectic, or dialogic, process. Dialectics help us understand opposition, differences, tensions, and diverse or divergent views. Dialectics are the way we separate out self from the other: this idea from that one. By debating and discussing, we grapple with and discern differences. Learning to explore diverse views, invite differences, and explore our differences openly is a powerful practice. 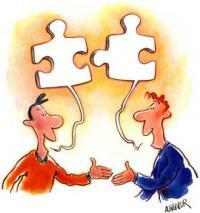 Dialogue is a neurological process that supports brain development. Dialogue is the movement of meaning—meaning that emerges through the unfolding, changing nature of experience. Things change and evolve. Dialogue is merging, synthesis, fusion of horizons, deeper understanding that embraces oppositions and tensions through new meanings that emerge as we explore our world through our interconnected reality. Dialogic conversations are the building blocks of relationships and a foundation for effectively working together. These three elements are crucial to inquiry in a work setting. When we want to take action we need to understand: What are the relationships? How do things relate and connect? Whose help do we need? How can we help each other? Who could hurt our forward momentum if we don’t build the relationship in the beginning? We also need to explore differences by honing our criticality to discern and discriminate: How would this action influence the results? How would this action affect things downstream? How does this recommendation differ from other recommendations? Where are the recommendations different, where are they the same? Which recommendation has more benefits? Which could have unintended consequences? In dialogue, a collective experience of what is present in this very moment enables us to explore and create shared understanding and coherent action. We agree here and here, but see it differently in these ways. What are the values we share? What common intentions do we have? What are we learning? Finding common ground helps outcomes unfold more successfully. Having a shared vision is a powerful engine for creating and implementing effective action. When we want to know how things work, how to make them better, how to create something new, the interplay of our relationships, dialectic conversations, and dialogue can deepen our relationships, align our actions, and give us the ability to achieve what we truly want to create.